Trevor Atkins was 11 when his father, Army Staff Sgt. 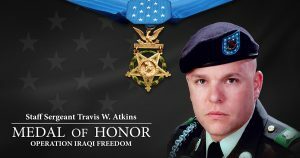 Travis Atkins, was killed while serving in Iraq a dozen years ago. On Wednesday President Trump will present the Medal of Honor to the Atkins family to recognize Travis for his heroism in saving fellow soldiers while losing his own life. On June 1, 2007, Staff Sgt. Atkins was conducting route security in the town of Abu Sarnak. He and his soldiers stopped a pair of suspected insurgents and Atkins was soon engaged in hand-to-hand combat with one who was reaching for his explosive vest.